Wall-mounted design, 5-gang electrical backbox. Typically designed for detention facilities. Options include momentary power-on button, or latching pushbutton. Communication is initiated by depressing the power on switch on the corridor-side communicator. All control circuitry is located in the corridor-side unit and connected to the dayroom-side via a factory furnished cable. 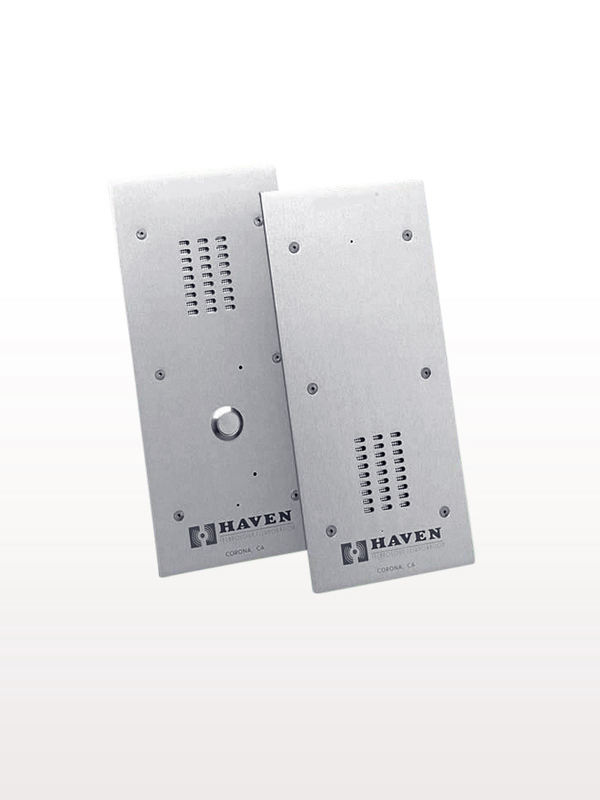 The SC-600 provides electronic two-way, hands-free audio communications (duplex) between a partition, and ideally suited for installation in hollow-metal frames. The SC-600 is equipped with a factory adjusted VOX switch to prevent ambient noise (below 85 decibels) from activating the unit. The SC-600 contains two voice channels, each incorporating a microphone amplifier, VOX switch, compressor, and a power amplifier. The sound amplifier does not exceed a 0.2% total harmonic distortion rating. Mounts to any standard 5-gang electrical box. The SC-600 is fully operational between 0°C and 50°C. Each order comes with an AC/DC power supply (120V AC stepped down to filtered 12V DC) and a 1-year warranty.